Employees take the stage to demand transparency at Walmart and protest hitches like low wages and scant advancement. 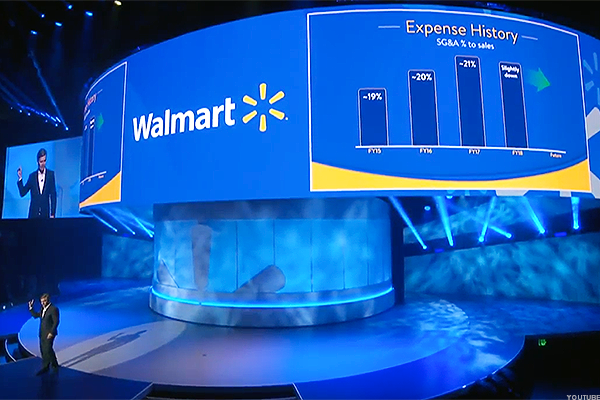 At Walmart's (WMT - Get Report) annual shareholders meeting on Friday, some employees took the stage to voice their grievances against the company about pay and advancement. "Today, I make over $10 an hour, and I appreciate that Walmart took this small step, but still too many of us are part-time, too many of us can't plan our lives or find the time to line up a second job or pay our bills," a three-year Walmart associate from North Carolina said at the meeting. The associate argued that many employees who work part-time wish to increase their hours and advance their career at Walmart with a full-time position, but the company instead hires more part-time workers. She urged Walmart to disclose the percentage of workers who are employed full-time and part-time broken down by race, gender and ethnicity "to embrace fairness." A Walmart spokesman said hourly full-time associates can earn as much as $24.70 an hour and on average full-time employees make $13.70 an hour. He said the company's "Open Shifts" program also allows part-time workers to view and pick up extra, empty shifts to gain more hours. Since 2014, Walmart has made various notable changes to how it treats its employees, after years of complaints. In 2015, the company introduced a $2.7 billion, two-year investment in its associates, raising its minimum wage initially to $9 an hour and then to $10 in 2016. Components of the program included bonuses, raises for 1.2 million employees and a training program that teaches fundamental retail skills, such as which items turn a profit, under which Walmart said it will graduate 225,000 associates from this year alone. "Hundreds of thousands of associates have taken advantage of new opportunities to advance their career as a result of our $2.7 billion investment in training, education and higher pay," a Walmart spokesman said earlier today. He claimed that Walmart's workforce is primarily comprised of full-time positions, adding: "Just last year, we converted more than 150,000 associates from part-time to full-time in Walmart U.S. alone." Amy Ritter, who said she advocates for Walmart workers through the group, Making Change at Walmart (MCAW), also spoke at the meeting, stating that all employees deserve better pay and "a better life." In an interview with TheStreet ahead of the meeting, Ritter said U.S. taxpayers pay $6.2 billion a year to cover government assistance costs, like welfare, for Walmart employees who can't afford to live on what the company pays them. She said some still make as little as $9 an hour. Shares of Walmart closed slightly down to $79.62.